When I grew up, I associated Belfast and Northern Ireland with terror, bombs, and injustice. Belfast by Boney M played on the radio over and over again, and TV showed countless bombs exploding in suburban areas. Back in the 70's I was too small to really understand what was happening, but both the news and the song followed me into the 80's. I still associate Belfast with something negative, but now it's cruelty to animals. I have followed the case of Lennox since 2010. Lennox is mix between Labrador and American Bulldog. His family had him since he was a puppy, and he was a companion dog to the disabled daughter. Lennox never did anything wrong, he never harmed anyone, but someone saw him and decided he looked like a Pitbull. One day, people knocked on the family's door. From what I hear, they even had coffee with the family, while they measured Lennox's head. They took him away to a city pound, explaining that based on his looks he might be dangerous. According to the local law, the family loses all rights to the dog once he falls under the breed specific legislations. He has been held by the city for two years, in a sad cage with sawdust on the floor. For two years, the family has fought to get him back. They don't even have the right to visit him, and when the 12 year old girl calls Belfast City Council to ask if she can come see her dog, they hang up on her. In some countries, keeping a dog in such a small confined area surrounded by his own feces, without even a decent place to lie down, would land you in jail for cruelty to animals. There has been petitions﻿ (if you haven't signed one yet, please click here to do so) and protests from people all over the world. They have even DNA tested Lennox to prove he isn't a Pitbull, but it doesn't matter; he looks enough like one to fall under the breed specific legislation. The mailbox of Belfast City Council is always full - very likely with e-mails regarding Lennox - and all the debate leads nowhere. The day before yesterday, courts decided the decision from 2011 stands: Lennox will be put down, because he looks like he could possible hurt someone in the future. I know a lot of people struggle every day to save pets no one wants; I'm one of them. This guy has a loving family that doesn't give up hope on him, and will probably still die. It's so frustrating and I feel so bad for both him and the family I want to cry. Honestly, if it was my dog, I'd be shot dead or in jail by now. 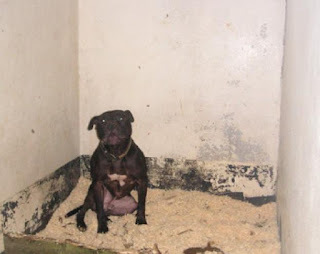 Oodles of people (including me) have offered to take Lennox so he can live, but guess what - Belfast City Council won't let him leave the country. When did it become okay to condemn someone to death based on the way they look? I'm not really surprised the court's decision stands; when so many people get involved in such a big fiasco, it might be hard to back down and admit they were wrong. Still, Belfast City Council, the one saving Lennox will be a hero of international proportions. You want people to think your city is the best place in the world. You want people to think they should go visit and spend their money in your stores, maybe think they should move there and open a business. 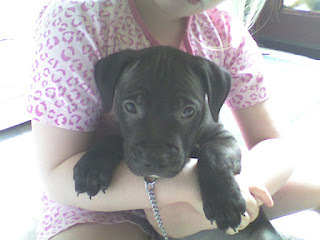 Turn the Lennox fiasco around; let him go home, and become heroes in the eyes of the world. The Save Lennox Webpage. The menu "About Lennox" tells his story very well. The Save Lennox Facebook page is a good source for news. There is also a Save Lennox Twitter account.